The study additionally provides a 'baseline' for climate change studies. By knowing how the atmosphere behaves to create patterns of extreme rainfall events, scientists will be able to gain new insights into changes that may be caused by global warming. Lead author Dr. Niklas Boers, from Potsdam Institute for Climate Impact Research and the Grantham Institute—Climate Change and Environment at Imperial, said: "Uncovering this global pattern of connections in the data can improve weather and climate models. "This finding could also help us understand the connections between different monsoon systems and extreme events within them. I hope that our results will, in the long term, help to predict extreme rainfall and associated flash floods and landslides in northeast Pakistan, north India and Nepal. There have been several such hazards in recent years, with devastating consequences in these regions, such as the 2010 Pakistan flood." By breaking the globe into a grid, the team could see where events occurred and determine how 'synchronous' they were—a statistical measure that assesses connections even if the events did not occur at exactly the same time. The results from this 'complex network' model, analysed using our understanding of the motion of the atmosphere, revealed a possible mechanism for how the events were connected. The patterns appear to be created by Rossby waves—wiggles in fast-flowing currents of air high in the atmosphere, known as the jet streams. Rossby waves have been connected to regular rainfall, but this study is the first to connect them to extreme rainfall event patterns. Co-author Professor Brian Hoskins, Chair of the Grantham Institute at Imperial, said: "The new technique applied to satellite data shows very surprising relationships between extreme rainfall events in different regions around the world. 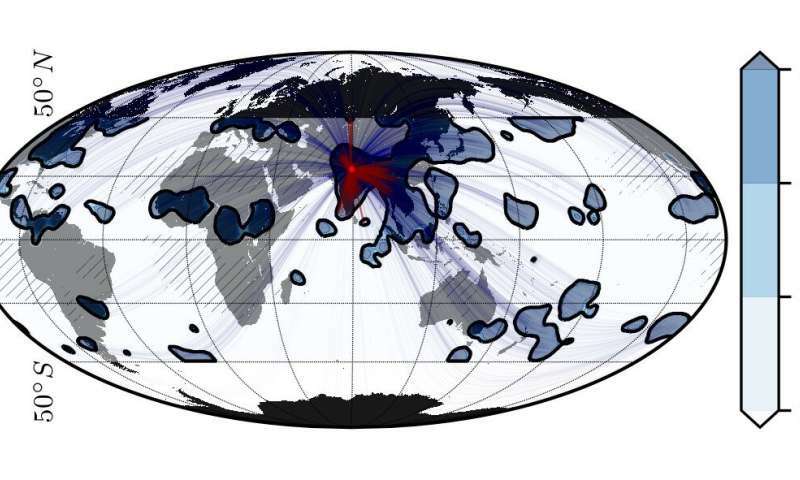 "For example, extreme events in the South Asian Summer Monsoon are, on average, linked to events in the East Asian, African, European and North American regions. Although rains in Europe do not cause the rain in Pakistan and India, they belong to the same atmospheric wave pattern, with the European rains being triggered first. "This should provide a strong test for weather and climate models and gives promise of better predictions." Co-author Jürgen Kurths, from the Potsdam Institute for Climate Impact Research, said: "This truly interdisciplinary study, which combines complex network science with atmospheric science, is an outstanding example for the great potential of the rather young field of complexity studies. As well providing insight into the spread of epidemics or information flow across networks, it can also be used to improve our understanding of extreme events in the climate system."